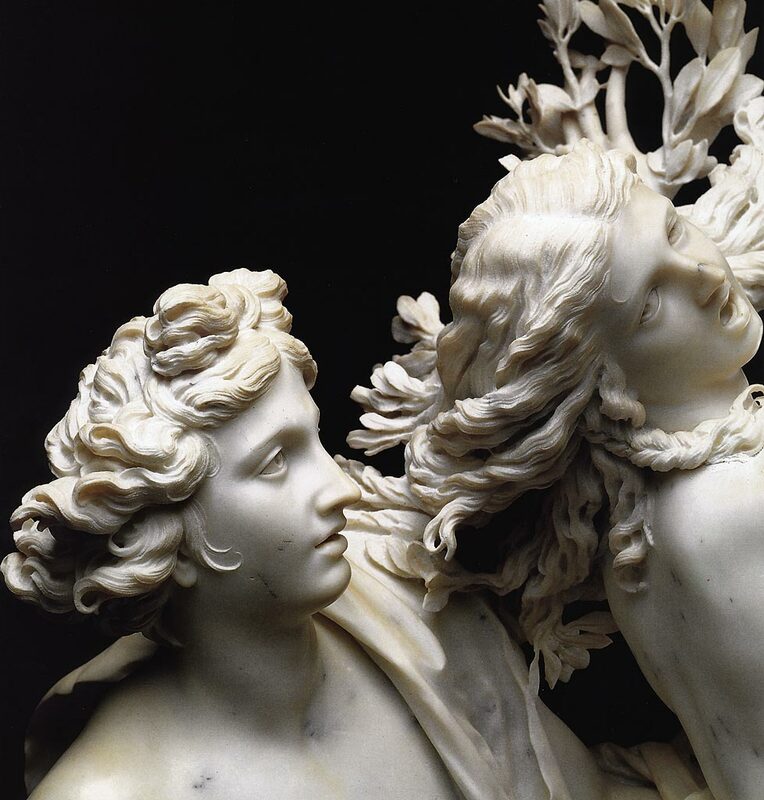 As the first artwork of this new year, we chose the marble sculpture Apollo and Daphne, by Gian Lorenzo Bernini. Why? Well, this statue is about an end and a beginning, death and rebirth, desire for change… sensations that lots of people feel when a new year is yet to start. Apollo and Daphne was commisioned to Bernini in 1622, when he was 24 years old. This is one of those situations in which I think: he was 24, he carved one of the most beautiful statues of anytime – I am 23, today I chilled 3 hours on the sofa… What am I doing of my life?! But OK, I am younger. I will definitely make something extraordinary next year. If he was just a boy when he made this sculpture, you don’t have to be surprised at all if after a while he built the Fountain of the Four Rivers in Rome, or St. Peter Square in Vatican City. Now, let’s talk about the Greek myth of Apollo and Daphne, described by the Roman poet Ovid in Metamorphoses. It all begins because of a man who wants to boast and show how strong and virile he is (thanks Ovid for demonstrating that not just girls are vain). Apollo was bragging to Cupid about how he has murdered the monstrous Python. But why instigating Cupid? Apollo, you’re the god of the sun and light, poetry, music, prophecy, plague, healing and more… Is it really necessary to boast to have killed a snake?! So Cupid get angry because he realized he never did something heroic in his life, and he prepared a revenge with his arrows. One Love-arrow for Apollo, who immediately fell in love with the nymph Daphne right after seeing her. And one Against love-arrow for Daphne, who started to run away from Apollo. The god chased the nymph like a real maniac and when he was about to reach her she asked for help to her father. This one, the rivers god Peneus, decided to transform her into a laurel oak. However, Bernini chose this moment of metamorphosis to represents the myth. Apollo is holding her with an arm around the belly, but she arches her back to avoid the touch with his body. Meanwhile the transformation starts: her fingers become leaves and the left leg is quite a trunk. The change is emphasized by the contrast between the ruvid part of the tunk and the smooth marble of their body. But Apollo didn’t give up, even in front of a tree. He didn’t accept the refuse and continue to love her. So he decided that the Laurel will be the symbol of glory to put on the head of extraordinary men. M. Butterfly effect: Mr or Madame? The Mothman: jinx or talisman?